Ronay is right that most Özil critiques – including those of Paul Merson and Ian Wright, both captains of cliché whom he inexplicably praises in the piece – are little better than fake news. He should have stopped there though, rather than push on in a desperate attempt to find the true reason for this particular player’s supposed travails. As it is, he has forced me to contend that his own argument, whilst not the same as those raged forth by Merse and Wrighty, sits snuggly alongside them in the lazy criticism cabinet. The cabinet is full of criticisms generated by stereotyping players and then assigning them weaknesses by throwing a blanket over the group. To Merson, Özil is a foreigner, and therefore irredeemably flawed. At least Ronay avoids that trope and assigns him a positive type: he’s good! But then he stumbles, right into the category called “Blame the best players for the team being bad”. Not good enough. You’ll no doubt recognise the category: it’s Wayne Rooney’s England career’s second home; Lionel Messi visits each time Argentina don’t win the World Cup. Like any good journalistic cheat code, it’s not restricted to football: LeBron James spent the first half of his now-unimpeachable career being slammed for somehow carrying terrible teams to within sight of the mountaintop. Players are generally reassigned and everyone gets on with pretending they were never a critic once a title is delivered, which makes Özil a strange case. In 2012, his Real Madrid team won La Liga, and he led the league in assists. In 2014, a year after he joined Arsenal, he started every game as Germany won the World Cup. Given Ronay explicitly eschews the Rule Britannia stuff we can assume he hasn’t just ignored these globalist feats; we’re left instead with his assertion that football has changed since then and Özil hasn’t changed with it. This is snake oil. There’s something to it – football is constantly evolving, and it’s pretty clear that the Premier League of Pep, Poch and Klopp is not the Premier League of yesteryear – but Özil hasn’t been left behind. The changes these managers have brought, requiring energetic pressing actions from their forwards, might alienate Merson’s Özil, but Ronay acknowledges Özil runs more than his peers – even within Arsenal’s conservative defensive scheme. He’s coping with the contemporary game just fine: his 28 assists in the past two Premier League seasons rank first, joint with Christian Eriksen, who Ronay says we should regard as an exemplar of success. His 2015/16 season – the season Arsenal spectacularly failed to finish above Leicester, giving rise to countless character critiques – was extraordinary according to any measure of chance creation you care to choose. It is not his fault if others fail to convert the opportunities he creates. There is a case to be made that Özil is not better today, aged 28, than he was in his final season at Real or his first season at Arsenal, when he was 24. There is not much of a case that he’s declined. His expected assist rate has rebounded this season to sky-high 15/16 levels at 0.47 per 90 after a relatively slow – for him – 16/17. That creative blip, falling to a lowly 4th in key passes per 90, coincided with his best scoring season: eight goals in the league and four in the Champions League. He’s back at the top of the key pass rankings through nine games this season. Ronay, rather than claim that Özil was never good or that he’s declined, complains that he has “failed to develop” during his time at Arsenal, and he puts this down to a “complacent” lack of “intellectual curiosity”. Quite apart from the fact that some serious assumptions have to be made to leap from stayed the same to intellectually uncurious, the skills Özil has mastered require an unusual understanding of the game and great imagination. What Ronay refers to as his “princely stasis” is in fact what we should expect from a player like him: Michael Caley has shown that attacking midfielders are typically in their prime between 23 and 28 and peak at 25. His development was done elsewhere and he arrived at Arsenal – unusually – as the finished product. His consistency, oft considered the hallmark of champions, is derided by Ronay as “playing the same game 166 times”. Merely being and continuing to be elite, apparently, is not enough. It’s true that Özil is the poster child of late Wenger-ism, partly because his arrival, a year before Alexis, heralded the end of Arsenal’s austerity, and partly because of his pass-first style. It’s also true that this era, despite the three FA Cups, has unquestionably been a great disappointment. Ronay’s error is in rolling Özil and the era into one. He infers that if the team has failed, then so has its shining light. This is a logical mis-step born out of an attachment to symbolism: the player is not the team, much less the club. 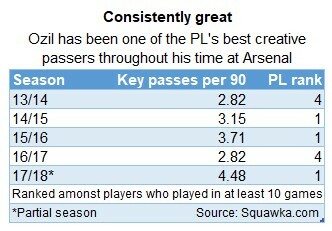 Refusing to adapt and learn is an entirely justified criticism of the Arsenal Özil has known, but not of Özil himself. His majestic performances have consistently created elite output despite the shortcomings of those around and above him. The sad fact of the late Wenger era is that Özil, like Alexis, has wasted his wonderfully productive prime in a shallow squad with gaping holes. The blame for this does not lie with him.